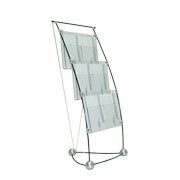 Portable literature stands are an ideal way to display your company brochures and pamphlets in a professional, easy to reach way. Their light weight and simple set up make them an ideal choice for trade shows, special events and many retail environments. 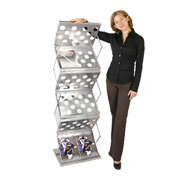 Which type of portable literature stand is right for you? Expand easily and lock into place for quick set up. When finished, simply collapse down for storage and transport. Strong, stable designs that can be used as both portable and permanent displays for your literature pamphlets and brochures. 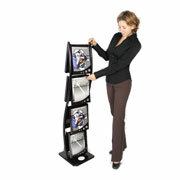 Modern, elegant designs that use carbon fiber rods and tension cables to create a great-looking display for brochures.